There’s just something about ramen. Its hearty, flavoursome and deliciously brothy character has transformed it into the foodstuff of legend for students and dining connoisseurs alike. Even Destiny’s merchants aren’t immune to its primal, umami magnetism. 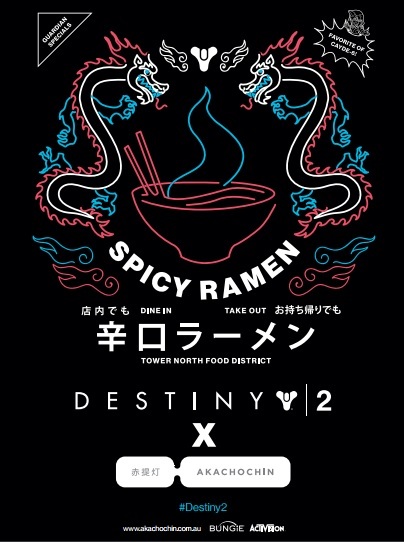 In celebration of Cayde-6’s undying devotion to wheat noodles, Melbourne’s own izakaya Akachochin has formed a gustatory alliance with Bungie and Activision Publishing to offer PAX Aus attendees one-off dining experiences. During the three day gaming extravaganza, which runs from October 27-29 at the Melbourne Convention and Exhibition Centre, three recipe variations will be available for taste-testing in a pop-up located at The Common Lawn. For those looking to play Destiny 2 during PAX Aus, make sure to stop by the NVIDIA, Razer or Alienware booths.